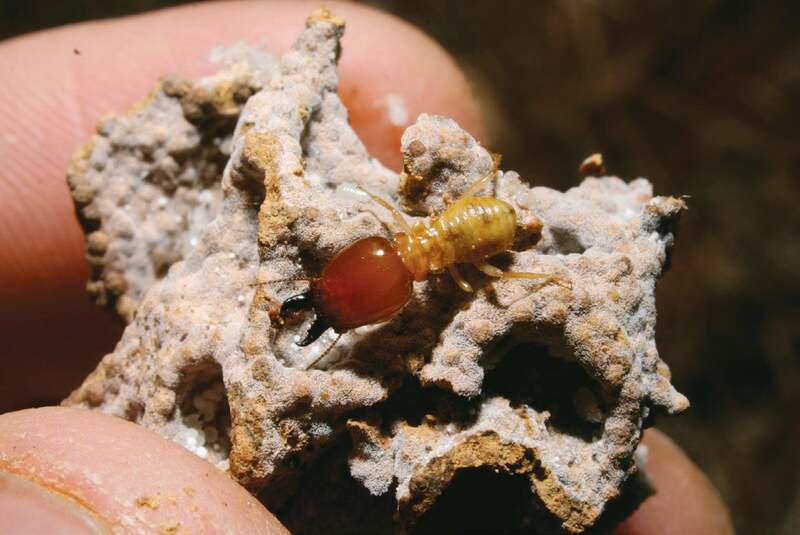 Termites are key players in the fertility of the world's arid grasslands. Their mounds support nutritious greenery and a wide variety of insects, geckos and even elephants. Princeton University scientists Rob Pringle and Corina Tarnita are using mathematical ecology to model termites' impact. Termites influence landscapes at a large scale, increase drought resilience and play a role in fairy circle patterns. Adapted from Underbug: An Obsessive Tale of Termites and Technology, by Lisa Margonelli, by arrangement with Scientific American/Farrar, Straus and Giroux (US). Copyright © 2018 by Lisa Margonelli. All rights reserved. After I came back from Australia, I wondered about a large bauxite mine that I’d heard of, where termites had rehabilitated the land. I wondered if there was more to the story than the fact that they fertilized the soil and recycled the grasses. There seemed to be a gap between bugs dropping a few extra nitrogen molecules in their poo and the creation of a whole forest. What were they doing down there? I started going through my files, looking for people working on landscapes. This led me to the work of a mathematician named Corina Tarnita and an ecologist named Rob Pringle. When I contacted her, Corina had just moved to Princeton from Harvard and, with Rob, had set about using mathematical modeling to figure out what termites were doing in dry landscapes in Kenya. As it happened, I had interviewed Rob back in 2010, when he and a team published a paper on the role of termites in the African savanna ecosystems that are home to elephants and giraffes. I took the train to Princeton to meet them in early 2014. By that time I’d been following termites for six years, and I’d pretty much given up on two ideas that motivated me early on: understanding the relation between local changes and global effects—that concept of global to local that dogs complexity theorists—and the development of technology that could potentially “save the world.” But through mathematical models, Corina and Rob and their teams eventually delivered a version of those things. And it was purely a bonus that they might have even solved the mystery of the fairy circles. Corina was teaching when I arrived at Princeton, which is a mixture of old buildings with weather-rounded bricks and cautiously futuristic buildings made of glass and new bricks, so I went to find Rob. Back when I talked with him on the phone, Rob had been using lizards to understand ecosystems. He would map off a section of land, cut it into a grid, and go in and count the lizards as an index species. If there were lizards there were bugs, and if there were bugs there were plants, and if there were plants there was some water. As it happened, places with enough plants to attract lots of lizards were also favorites of elephants. And elephants were, in a way, the point of these studies: everyone wants more elephants. In the relatively dry savanna in Kenya, Rob had been finding between 300 and 1,100 geckos in his plots, but there were two places where his lizard counts went through the roof: in abandoned cattle corrals filled with dung and on termite mounds. The dung was obvious—it would fertilize lush plants that would attract insects—but the relation between geckos and termite mounds was not. Fungus-growing Odontotermes termites in that part of Kenya build most of their mound underground, so they look less like the fingers of dirt you see elsewhere in Africa than like land with a case of chicken pox, with each bump of a mound situated 20 to 40 yards from other bumps on all sides. The closer he was to the center of the mound, the more geckos Rob found. So then he looked at the bunchgrass and the acacia trees. A similar pattern. It was as though the termites had organized the entire landscape from below into a large checkerboard of fertility. “The termites are unwittingly pulling the strings without coming out of the ground,” he had said when I called him in 2010. When I first heard Rob talk about the black box, I understood it as a metaphor rather than an engineering concept. Now, as I looked over my old notes, I wondered what he had meant by it: Was he really looking to engineering to answer an ecological question? Or did he also mean it metaphorically? What really bugged Rob about termites was the pattern they created on the land. It was as though the termites created a lattice that turned an otherwise monotonous plain into a series of hotspots. Something was going on with the way the space was organized that made the entire system more productive. And with the advent of remote imaging technologies such as lidar, which uses lasers to create images of the ground, these patterns were showing up all over. The amount he did not know had bothered Rob: “I can’t not notice these patterns whenever I get in a small plane or look at Google Earth.” I knew what he meant because I’d seen similar patterns. When he was at Harvard, he had shared his irritating problem with Corina. I knew that Rob had a fine sense of the absurd because I’d run into a photo of him online wearing a black suit while wrestling with a tape measure near an electric fence. When I found him in his office, he was wearing jeans and cowboy boots amid Princeton’s old brick. Corina arrived from class in high boots and a striking dress, poised and glamorous in the unadorned junior faculty offices. She also has a profoundly cerebral air: she takes things in, refracts them through a mathematical prism and sees them in an entirely new way. Corina grew up on a farm in Romania, was fascinated by math early on and won multiple prizes before heading off to get an undergraduate degree at Harvard. She started her master’s program there working on something called high-dimensional geometry but switched midway to mathematical biology, where the questions were more real and messier. She became interested in how cooperation works, and in 2010 she published the big paper reexamining a well-accepted theory for the evolution of social insects with biological mathematician Martin Nowak and entomologist E. O. Wilson. Corina had spent a year redoing the math behind the theory and found that the fact of being related alone wasn’t what made cooperation successful. When a queen could produce daughter ants that would stay and raise her brood, more of her babies survived: cooperation produces more kin. One afternoon, after they had been working on their National Science Foundation grant proposal for three weeks, they went for a walk. They went past a field that had been burned; the vegetation was just stumps of grass, not the waving tops. Corina thought she saw something and asked to stand on the roof of a Range Rover. And then she saw it, among the burned stumps: two separate patterns interacting with each other. First there was the polka-dotted pattern of the mounds, and then she thought she saw a leopard-spot pattern in the vegetation between the mounds. Leopard spots beckon to biological mathematicians because they are a natural shape with a theory behind it. The leopard pattern resembles a Turing pattern, a theoretical construct that was first proposed by British mathematician Alan Turing in 1952 and was subsequently demonstrated in some natural systems. If you’ve seen leopards, zebra fish, zebras-who-are-not-fish, seashells and chameleons, you’ve seen these patterns, which are sometimes called reaction-diffusion or scale-dependent patterns. They are essential components of the world’s organization, influencing everything from how slime molds form in sink drains to the way rabbit brains perceive smells. Working with Juan Bonachela, a theoretical biologist trained in statistical physics, and Efrat Sheffer, a Jerusalem-based biologist who studies the relation between individual plants and their ecosystems, Corina began to build a model, starting with a proxy for how termite mounds organize the landscape: a simple lattice of hexagons. Termites leave the mound to forage in an ever widening circle, but over many decades, as a landscape gets filled with termite mounds, the foraging zone of each mound bumps up against others. When all the mounds contain roughly the same number of termites, they end up spacing themselves across the landscape evenly. Where the radius of foraging termites from one mound hits the radius from the next, they form an edge. It’s not a perfect border, and it’s not visible aboveground. But it’s there anyway, perhaps caused by the ferocious fighting their postdoc Jessica Castillo-Vardaro saw when she put termites from two mounds together or maybe caused by termites avoiding other termites who don’t smell like their kin. If the mounds are distributed evenly across the landscape, most mounds will have six neighbors. In the end, the mounds look like a patchwork of hexagons, maximizing the distance between every mound. This made sense: many other creatures have self-organized hexagonal territories, including wolves, Alaskan sandpipers and even some kinds of fish. Next the team built a model for the pattern in the grass. The basic concept of Turing models is that there are two different feedback mechanisms. Within a short distance, growth is encouraged (activated), and over a long distance, it is discouraged (inhibited). For example, plants that are close to one another may help one another by more efficiently absorbing water from rainfall, creating a little tuft, but over distances the tufts begin to compete for water, suppressing growth and leaving bare dirt. In a model, if you give the activator and the inhibitor each four different parameters (how fast they diffuse, how strong they are, and so on) and build a model where they interact, over time they will form a characteristic set of patterns. Those with a strong activator, say, will form large spots, whereas those with a strong inhibitor will form small polka dots. Play with the parameters for diffusion at the same time, though, and you’ll get patterns that look more like a tortoise shell, a bunch of doughnuts, gaps or stripes, or a labyrinth. These patterns look very much like things in real life, including mussel beds, coral reefs and fungi. So biologists have speculated that the activators for such scale-dependent feedback could be as diverse as water, hormones or organisms helping one another; the inhibitors could be drought, hormones or predators. Using a mixture of activators and inhibitors appropriate for the grasses in Kenya, Corina and Juan built a mathematical model that created scale-dependent feedback patterns. Playing with the parameters on the grasses alone, they could limit the water and turn the tufts from big tufts to a labyrinth and finally to desert, which looked a lot like the photos. “We said, ‘Okay, there’s plenty of reaction diffusion,’” she said of the grass patterns. “‘Can we couple that with the termite patterns?’” She combined the self-organized termite mounds and the scale-dependent feedback model for the grass. Now, instead of an even pattern of polka-dotted mounds in the middle of hexagons or a leopard pattern of grasses, the leopard pattern arranged itself over the hexagons: lush over the resource-rich mound in the middle and sparse at the edges of the mound. Corina printed out images of the two models interacting, with different amounts of rainfall, and showed them to Rob. In very general terms, the images looked like African patterned cloth: regularly spaced large dots surrounded by halos with a kind of calico background pattern. The dots were the mounds, and the calico was the leopard pattern in the grass. When Corina and Rob compared the models with satellite images of termite landscapes in Africa, they found that they looked very similar. They could even zoom in on the calico in the model to see the shapes of the bunchgrass, and they found it resembled the shapes in the photos they had taken. These patterns had previously been hidden in plain sight. “It was the convergence of the model predictions and the data that made me believe,” Rob said. For Corina, the thrill was finding that the two different patterns, at multiple scales, were interacting and influencing each other. The local was connecting to the global, and it was even showing up on the satellite maps. “I’m happiest when models can be tested and we find so much agreement,” she said, with obvious delight. For me, the math of Corina’s team explained the unsettling feeling I had looking out of planes in Namibia and Australia. That sensation that I could almost see the pattern of a Persian rug in the landscape had been correct. And now that I could finally really see the design in her modeled images, I thought about how Corina’s intuition had combined with the powerful math of the models to reveal something new. In the early 20th century the eccentric termite observer Eugène Marais had said we would need a “new alphabet” to see termites as they really are. Perhaps this was that alphabet. But running the two models had provided another insight, with much bigger implications. In fiddling with the rainfall on the mounds, Corina discovered that when grass was associated with a termite mound, it could survive on very little water, much less than expected. In the simplest terms, termite mounds made the landscape much more drought-resistant. This observation had a practical benefit. Biologists had used patterns of labyrinths and spots to predict that some dry landscapes grew patchy just before catastrophically shifting to become deserts, which is a great fear in both Africa and Australia. Those theoretical models, from the mid-2000s, predicted that when these dryland systems crashed, they would not gradually dry up but would instead progress from a labyrinth pattern of grass to spots and then basically fall off a cliff (called a critical transition) to become desert. Recovery would be very difficult, if not impossible. But when Corina adjusted the rainfall in the model to produce the labyrinth of plants that might precede a crash, she found that when a landscape had termite mounds, the crash occurred very slowly—it was not a cliff but a staircase. What this meant was that places that had termite mounds were much less likely to become desert, and if they did, they were likely to recover when rains reappeared. As long as the termites remained, grasses would sprout first on the mound and then in distinctive patterns. Termites, then, appeared to increase the robustness of the whole place, in addition to providing homes for the geckos and food for the elephants. And with dry lands making up about 40 percent of the world and climate change redistributing rainfall, termites might actually be saving the planet. For real. For once. The model was nice, but models are a pseudo world. The team’s next step was to further test the model’s predictions with experiments in the Kenyan fields. By giving some mounds and their surroundings extra water while preventing others from getting rain, Rob and Corina and their team hoped to see whether the grass patterns would change as their model predicted. To do that, they needed to figure out how to block rain on some plots while increasing it on others. Fellow Princeton researchers Kelly Caylor and Adam Wolf were doing something similar in the Pine Barrens, a large forested area in otherwise suburban New Jersey, and they said I could tag along when they went to see their structures. It was a cold day in November, and the Pine Barrens lived up to their name: miles of tall dark pines, scraggly in late fall with relatively clear ground under them. In the woods, the researchers had built careful little shelters out of two-by-fours, using Home Depot hardware, to prevent rain from falling on some plots, while sprinkling others with extra water. Under the pines it was dark and even chillier. I had worn only a fleece, and I tried to conserve heat by hunching. Rob thought that the elephants were not going to like the little houses guarding an oasis of scrumptious-looking grass in a dry savanna. “I think elephants are a generalized stochastic hazard, but they’re going to be very attracted to the water.” He doubted that they could build something strong enough to keep them out. The elephants were wily, too. Even electric fencing would have drawbacks. “If we put fence that’s two meters high, the elephants will play with it and mess around, but the giraffes will run right into it because they’re not paying attention.” It was funny to stand shivering under these dark pines in New Jersey, talking about the fields of inattentive giraffes. On the way back to Princeton they mentioned they had had informal conversations with colleagues who questioned whether the patterning was the result of termites. Rob felt that some of the skepticism came from scientists unfamiliar with self-organizing systems, who might think that such large-scale pattern organization implied a “mastermind.” And some ecologists assume that if competition among termite colonies is strong enough to drive this elaborate patterning, then it is likely to push the resource base toward collapse. The idea that termites could be competing so strongly that they create patterns while making the ecosystem less likely to collapse? “It’s a hard hump to get over,” Rob remarked. Back in her office, Corina explained that her next plan was to work with the team to build a far more detailed model of both termites and grass with which to go to the Olympics of the patterning debate: fairy circles. Fairy circles are mysterious, roundish areas of dirt found in northern Namibia as well as in Australia, generally surrounded by grass. In aerial photos they look like regularly spaced pinkish elephant footprints of dry dirt, ranging in size from about nine to 98 feet across. They have been the subject of fierce debate between scientists who say they are made by termites and others who say they are made by grass patterning. Although these patterns have been the subject of scholarship since the 1970s, interest in them spiked between 2012 and 2016, when a small spate of papers attributing the circles to one thing or the other appeared in journals. Corina felt that with a more complete model she could show that the fairy circles were the result of the termites’ self-organization and the grasses’ scale-dependent feedback combined. Building the model was difficult, however. “The model forces you to have a rule for everything. You can’t have any blank spaces,” she said when we spoke early in 2015. “It forces you to consider what you might not consider otherwise.” The termites were toiling away in their black box underground, unknown. She was deep in termite literature and communicating daily with Juan in Scotland as the team built the computational aspects of the model. Corina said it was the most complex model she had ever worked on, and she was facing inconsistencies in the thinking about scale-dependent feedback: the idea that plants benefited from being close to one another made sense, but did competition really suppress growth on a large scale? Another question was how termites concentrated nutrients in the space—of course, they brought grass back to the mound—but they also processed some in their guts, such as bioavailable nitrogen. It was a big puzzle. In 2017 the team, which also included researchers Jennifer Guyton, Tyler Coverdale and Ryan Long, published a paper that modeled how burrowing animals such as termites, ants and rodents might interact with grasses to create vast patterns and structures around the planet. Adding the termite lands of Africa, Asia and Australia to similar earthmound-field landforms such as Brazil’s murundus, the mima mounds of the Pacific Northwest and the heuweltjies of South Africa suggested that many tens of thousands of square miles may have been reordered from below. No mastermind could have possibly pulled this off: only trillions of mini minds could possibly have taken on a task this big. Now that I could see this relation between the tiny diggers and the great scope of land from the air, I felt sympathy for the early explorers who looked into termite mounds and saw only metaphors for human society and proof of the rights of kings. By looking inward, they had missed seeing the earthly equivalent of the celestial spheres. In the mound, it is possible to see the entire order of the terrestrial sphere or, in more modern language, the progress from local to global. First there is the teeming world of the termite’s gut, processing grass; then the world of the termites, digging and grooming in their great social pile; then the world of the termites and their fungus, communicating in the mound through waves of chemistry and water vapor; and then the world of the plants and geckos on the surface. Way up in the air, a giraffe obliviously munches on a tasty leaf. And from the air, a regularly ordered carpet of fertility and superfertility becomes evident. And finally, a planet with an atmosphere. Like the giraffes, we humans are ignorant of the vast churnings of smaller and larger worlds that we cannot see. We anthropomorphize or abstract these relations into puny concepts we can understand: aristocratic insects, altruism, competition, cousins, bad guys and good guys. But these collaborative behaviors, along with the sensing and signaling capabilities they require, may be the building blocks of complexity. For a little while I had recriminating thoughts about the failure of humans to see beyond ourselves into the vast universe: we have so little ambition! But then I read a speech on the problem of scale in ecology, given by Princeton ecologist Simon Levin. And when I read it, I realized that we are subjects in this experiment ourselves, and our fitful awareness is part of what makes us human. Levin said that the world needs to be studied on multiple scales of size, time and organization—there is no one “correct” scale. In fact, the scale at which we see the world is a product of how we have evolved and how we will continue to evolve. “The observer imposes a perceptual bias, a filter through which the system is viewed. This has fundamental evolutionary significance because every organism is an ‘observer’ of the environment, and life history adaptations such as dispersal and dormancy alter the perceptual scales of the species and the observed variability.” For humans as well as termites, these limits in how we perceive the world are the very core of who we are. Spatial Pattern Enhances Ecosystem Functioning in an African Savanna. Robert M. Pringle et al. in PLOS Biology, Vol. 8, No. 5, Article e1000377; May 25, 2010. Termite Mounds Can Increase the Robustness of Dryland Ecosystems to Climatic Change. Juan A. Bonachela et al. 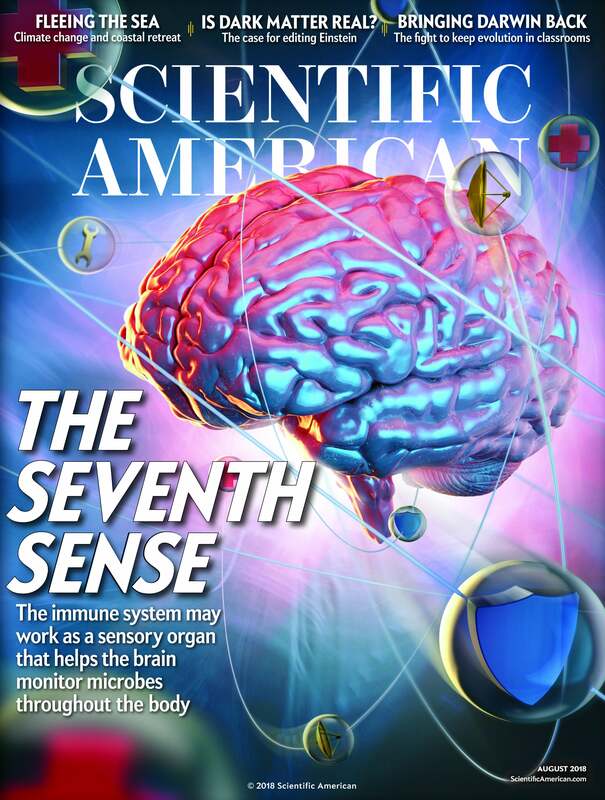 in Science, Vol. 347, pages 651–655; February 6, 2015. A Theoretical Foundation for Multi-Scale Regular Vegetation Patterns. Corina E. Tarnita et al. in Nature, Vol. 541, pages 398–401; January 19, 2017. The Chemical Defenses of Termites. Glenn D. Prestwich; August 1983. Lisa Margonelli is deputy editor at Zócalo Public Square, an Arizona State University magazine of ideas. Her previous book is Oil on the Brain: Petroleum's Long, Strange Trip to Your Tank (Random House, 2007).